Hiya my Food Hippies! 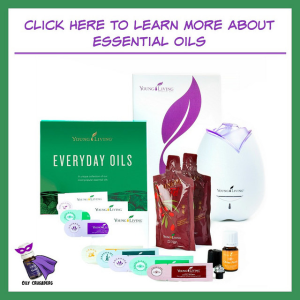 Today I’m featuring another guest blogger and this recipe comes just in time for you to start planning what you’re going to make for your Memorial Day cook-out. It’s coming up you know. 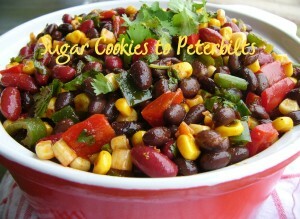 A recipe for a Mexican Bean Salad comes to us from Kris over at From Sugar Cookies to Peterbilts. A big shout out to all of you Real Food Girl: Unmodified readers! 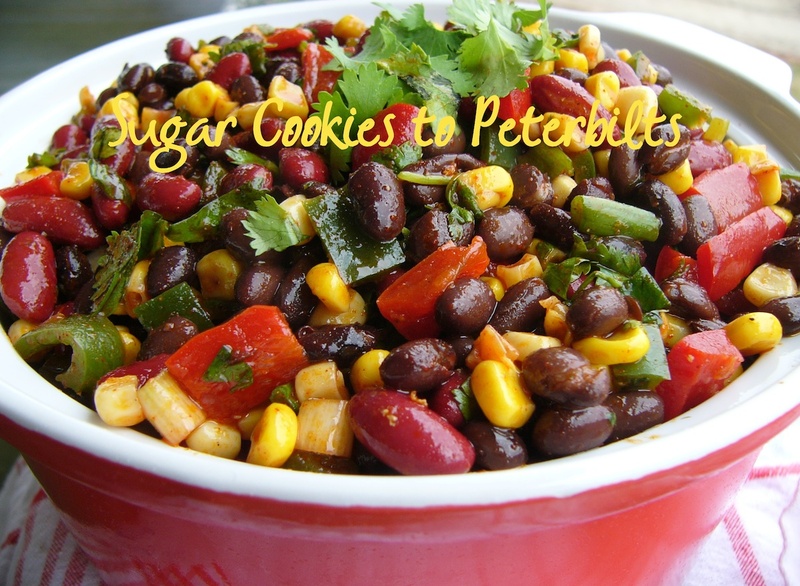 I am Kris from Sugar Cookies to Peterbilts, and I am SO very excited to be over here on Real Food Girl: Unmodified with all of you! A little bit about myself: I am a former city girl, actually from same area as Real Food Girl! I left that cold state to get warmer, and only made it one state east. Believe me, as cold as this winter was, we will be trying the move again, and hopefully next time we will make it to where it really is warmer! Since leaving the city, I ended up learning farm life. Quite the change, but you know what? I LOVE it! I may not get my choice of what restaurant to go to every night, and can’t stop on the way home for take out since the majority of our restaurants are more than 30 miles away. But, I do get to have a garden as big as I can manage, it is getting bigger every year. I get to raise my own chickens, so we enjoy fresh eggs daily! The change in lifestyle has been awesome, and led me to give up the boxes mixes of “just add beef or chicken”. The change started out of availability, and not being 2 miles from a grocery store. It ended up getting me back in the kitchen and actually remembering how much I enjoyed cooking and baking. I so enjoy having my fresh foods and eating less processed foods. Our taste buds certainly appreciate the change also! I hope you enjoy my Mexican Bean Salad. This is always popular at summer picnics, and with no mayo or dairy, there are no worries about it sitting out for a while. Lately, I have been taking it for lunch, and having it along with some Mexican Rice. Drain and rinse the beans. In large bowl, add beans, corn, peppers, onion and cilantro. Set aside. In small bowl, add cider vinegar, oil, chili powder, salt and pepper. Whisk until all ingredients are combined. Pour over veggies. Chill overnight. When ready to serve, stir and garnish with more cilantro.